Select Access. Use the drop-down list box to select the desired Access Level. Only items with the specified Access Level will be displayed in the list. Open in parent window. Open the link in the current browser window. Open in new window. Open the link in a new browser window/tab. Open in popup. Open the link in a popup window (browser without navigation controls). Count Clicks. Whether or not to keep track of the number of times each link has been clicked ('Hits'). Icon. The Icon to be displayed to the left of the Web Links URL. Select an image file from the drop-down list box. The images are listed from the 'images/M_images' folder. Category Title. Hide or Show the title of the selected category as a subheading (usually a Heading 2 or "H2"). Category Description. Hide or Show the description of the selected category. Category Image. Hide or Show the image of the selected category. Subcategory Levels. The number of subcategory levels to display. Empty Categories. Hide or Show empty categories. A category is considered to be empty if it has no items and no subcategories. Subcategories Descriptions. Hide or Show the descriptions for subcategories. # Web links. Hide or Show the number of Web Links in each category. Top Level Category Description. Hide or Show the description of the top level category or optionally override with the text from the description field found in menu item. If using Root as top level category, the description field has to be filled. Display Select. Hide or Show the Display Select dropdown listbox. Table Headings. Hide or Show the headings in list layouts. Links description. Hide or Show the Link Description for each Web Link. Hits. Hide or Show the number of hits for each Web Link. Pagination. Hide or Show pagination controls. 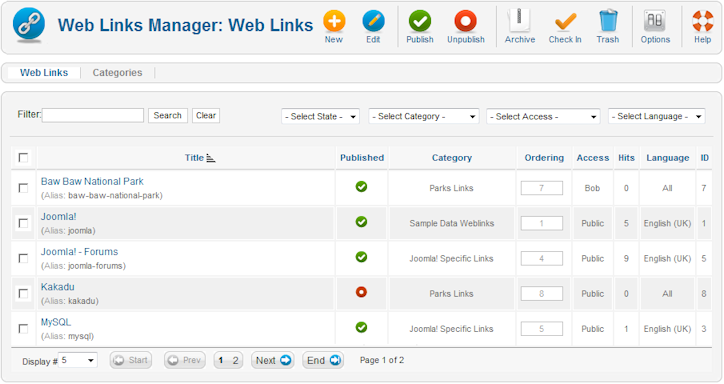 Pagination provides links at the bottom of the page that allow the user to navigate to additional pages. These are needed if the information will not fit on one page. Pagination Results. Hide or Show pagination results information, for example, "Page 1 of 4". Show Feed Link. Hide or Show an RSS Feed Link (A Feed Link will show up as a feed icon in the address bar of most modern browsers). For each feed item show. If set to Intro Text, only the Intro Text of each item will show in the newsfeed. If set to Full Text, the whole item will show in the newsfeed.